To use the Charges functionality in any service-related process of Oracle Applications, items have to be set up in Inventory as Material, Labor or Expenses item. After the Billing Type Codes are created they have to be attached to Billing Categories. Ø Add the Billing Type from the dropdown and the corresponding Billing Category and save. Ø Enter the effective dates, choose the Service Activities associated with this Business Process and save. Ø If the Activity being set up is of type Return, then select Reference Reqd check box in the Source Info region. 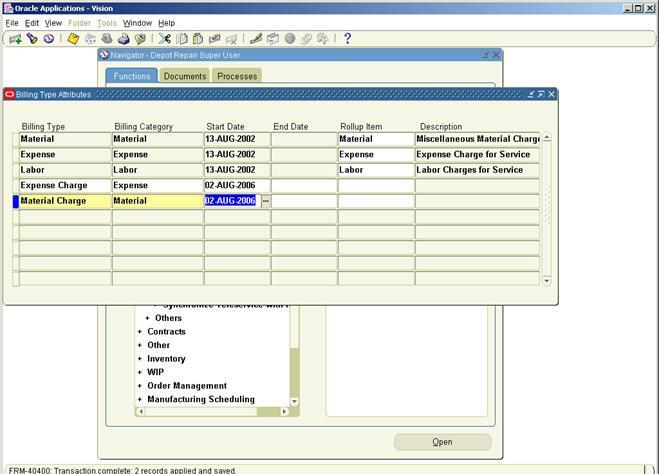 If there is a change of ownership of the part, then select the Change Owner check box and select Internal from the Change Owner to drop-down. To make an update of status of the item in the customer’s installed base, select a new status using the Status LOV. Selecting the Return Reqd check box would mean that the Return By date field in Charges would have to be filled by the Depot Repair Agent. 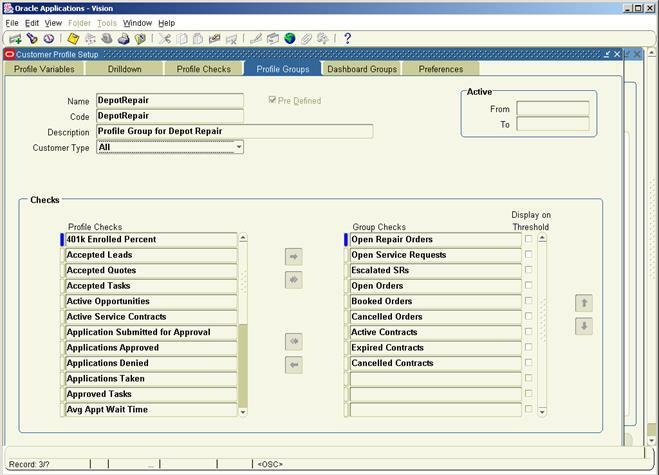 Ø If the service activity is of type Order used to ship replacement parts or repaired items to customers, then check the Reference Reqd checkbox. This would mean that agents would have to enter the instance number of the item being replaced/ returned. To record change of ownership, the Change Owner checkbox has to be checked. Select External from the Change Owner to dropdown. If the status of the item in the customer’s installed base has to be updated, then select a new status using the Status LOV. 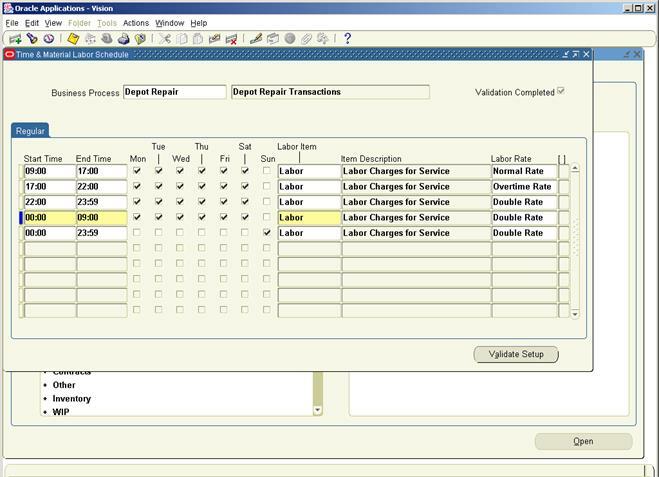 Ø In the Source Transaction Type region, use the Application Name LOV to enter Oracle Order Management. This permits Oracle Depot Repair users to use this subtype. Ø Select a valid source transaction type from the Transaction Name LOV and check the Update IB checkbox to permit Order Management to update the installed base when an item is shipped or received. Select the Default check box if this subtype is to be set as default for Oracle Order Management. · Advance Exchange - The depot sends a replacement item to the customer before receiving the damaged item for core credit. · Exchange - The depot sends a replacement item to the customer after a broken item is received from the customer for core credit. · Loaner - The depot sends a loaner item to the customer. · Loaner, Repair and Return - Same as Repair and Return with an item loaned to the customer before receiving the broken item, so as to bridge the gap while the damaged item is being repaired. 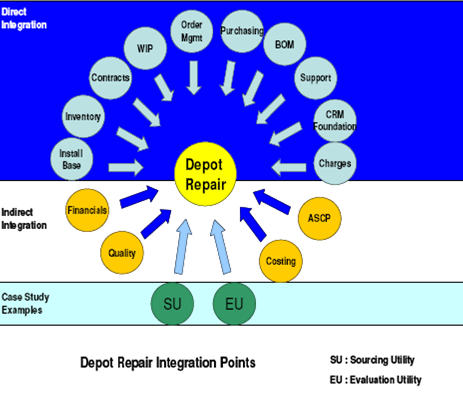 · Repair and Return - A broken item is repaired by the depot, and then returned to the customer. · Replacement - The depot sends a new replacement item to the customer without having to receive a damaged item from the customer. · Standard - The depot agent is uncertain about a customer need, and is unable to take a decision before further inspection of the damaged item. RMAs and Sales Orders are created manually. The depot agent has the option to carry out all functions in a manual mode. · Refurbishment - A Repair Order and its associated Service Request is created in the Spares Management of Oracle Field Service as a result of a demand for refurbishment or replenishment. The Repair Order has a Repair Type of Refurbishment, and has two transaction lines, Move In and Move Out. The Move In line tracks the shipment of the defective item from Spares Management, and its reception into the depot. The Move Out line processes the shipment of the repaired item back to Spares Management. Ø The Repair Type Ref identifies the type of application logic that applies to the Repair Type and has all the seeded values in the LOV. Select the relevant value. Ø Choose the Price list (Optional) to associate with a Repair type and enter Start date and End date. 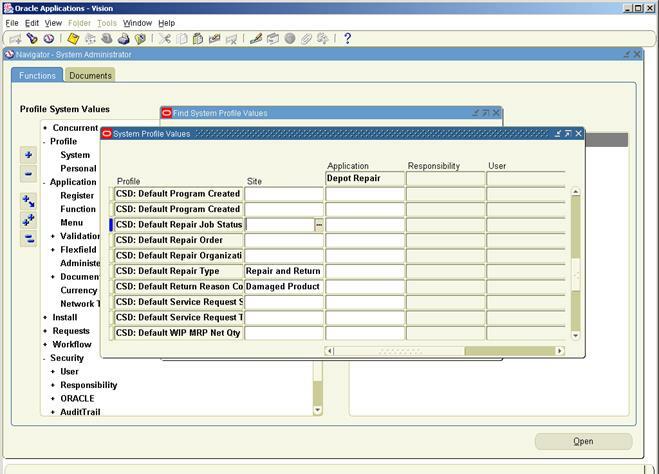 Ø The Billing types and the corresponding Service Activity Code have to be selected. 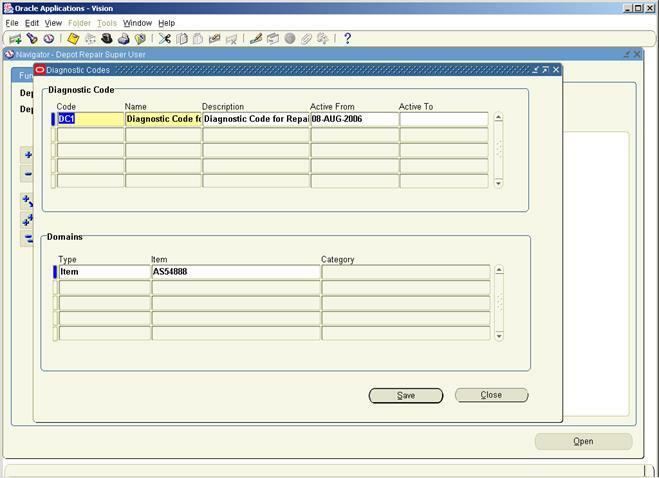 For Material and Expense more than one Billing Type and Service Activity Code can be selected. Ø Check the box Automatically enter and book RMA. 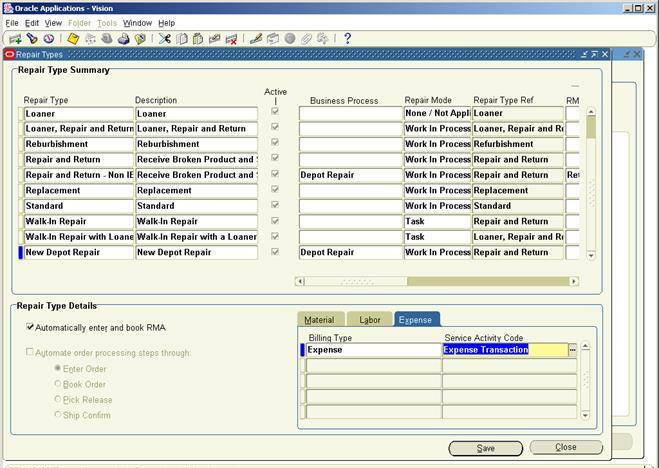 When a Repair Order is created with this check box selected, an RMA (Return) line is entered and booked automatically. At least one service request should be defined for use in Depot Repair. 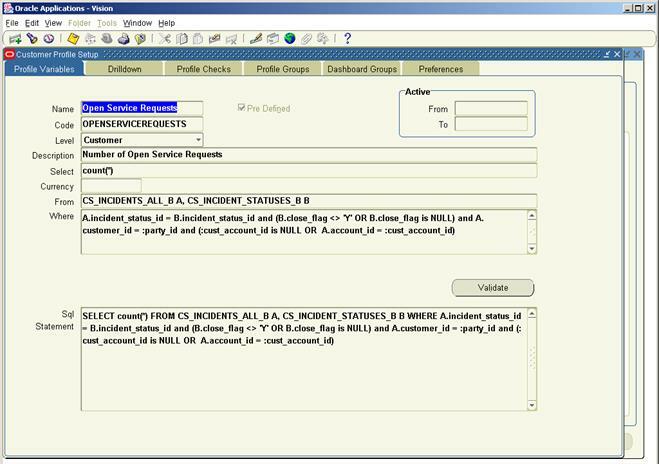 During the definition stage, a Service Request Type should be linked to a Business Process. 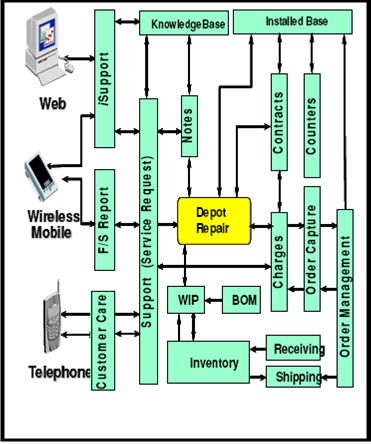 So while creating a Service Request Type for Depot Repair it has to be associated with the applicable Business Process. Ø To create a new Service Request Type click on New in the toolbar. 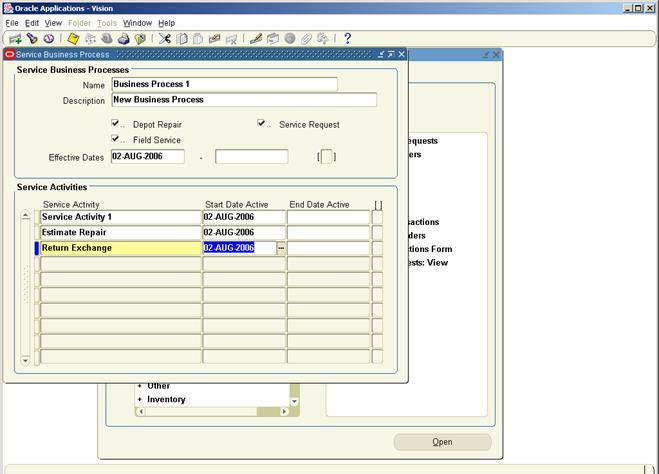 Ø Select the Business Process to which the new Service Request Type is to be associated. In this case select Depot Repair. For each different reason behind the return of an item there are Reason Codes defined. There are 11 seeded Reason Codes that are provided and additional Reason Codes which are organization specific can be set up by accessing the “Application Object Library: Reason Lookups” window. Customer Profiles define the extent of customer information that a service representative/agent can access. Customer Profiles provide agents with customer information in a graphical/visual format. Besides making it possible to create summaries of key customer information called profile checks, Customer Profiles also has the feature to drill down to detailed information. Profile Checks can summarize information by customer, by account, or by customer contact. Defining Profile Ratings involves the setting up of rating labels (the wording and colors) to be used with Profile Checks and Categories (to which they are to be associated). The labels describe the range of values of Profile Checks. The three seeded values of Profile Ratings are High, Medium and Low. The newly created Ratings become labels when colors are associated to them. 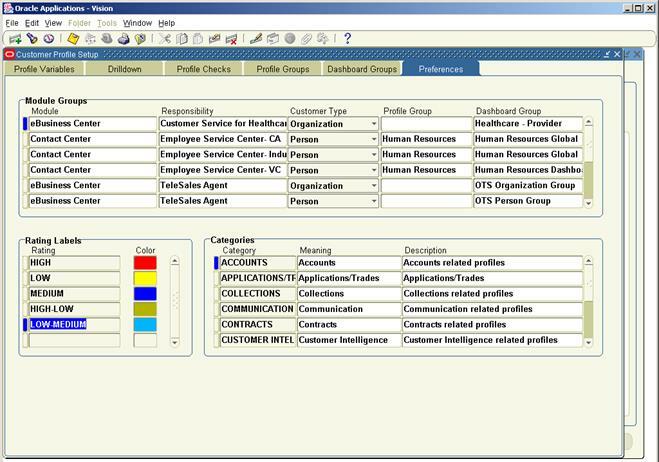 Categories are used to group Profile Checks and are useful in organizing Profile Checks used for similar purposes. Drill-down windows can be defined at two levels. 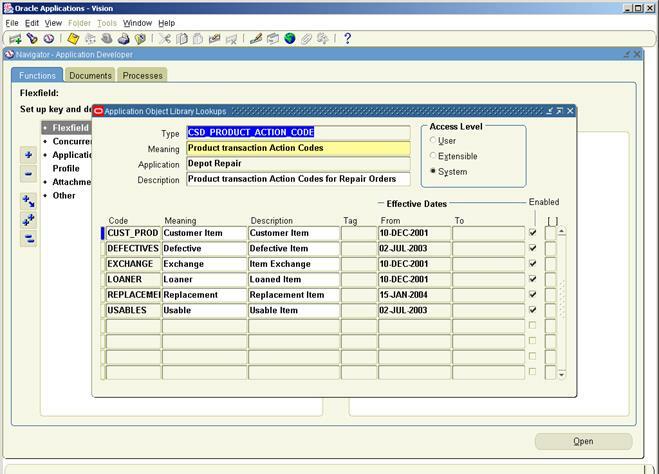 The first level lists the items summarized by the profile check. The second-level drill-down window is the application window which displays the details of an individual record. An agent displays an item in the application window by double clicking on one of the fields in the summary list. Profile variables, ratings, and rating labels must already be defined. 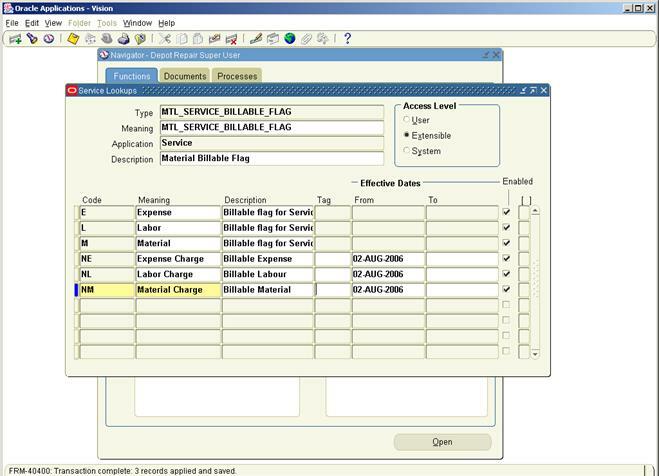 Ø Select a level for the Profile Check from the list of values. This is based on the information that is summarized by the Profile Check. 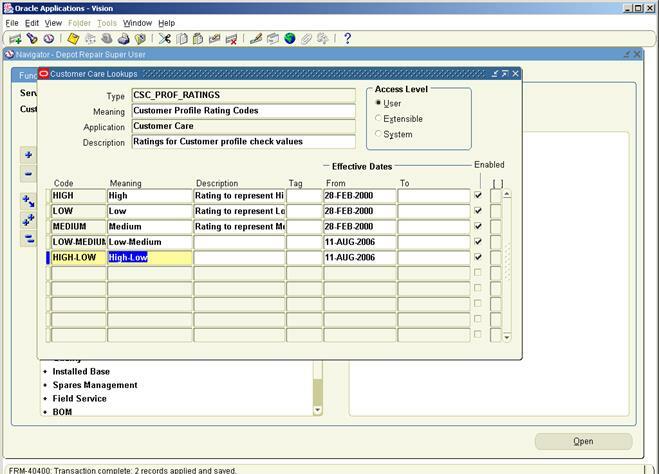 Profile Checks previously defined have to be grouped for display in the Customer Profile window. 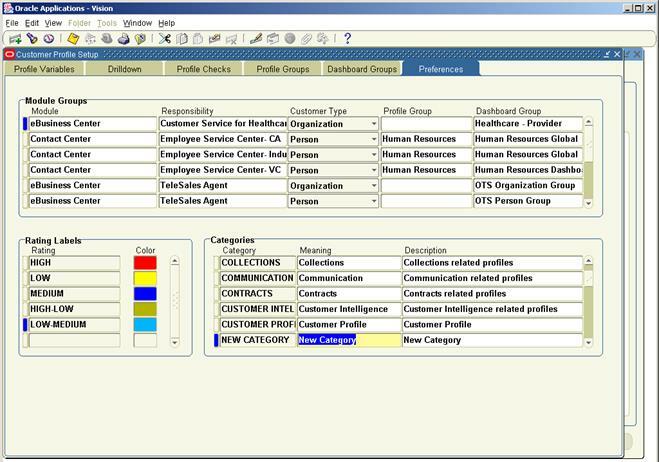 Associating Profile Groups with application modules and responsibilities enables providing different groups of agents with different customer views in the Profile window. Defining Dashboard groups helps in enabling varied Dashboard tab views for agents based on the application module and responsibility. It creates different views for customers, individual accounts, and for customer contacts. 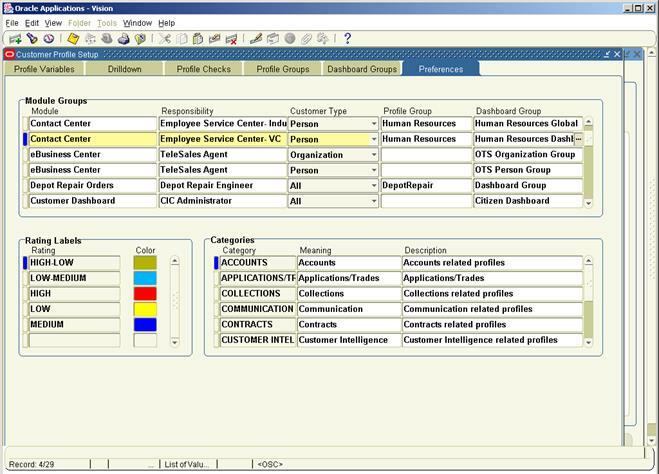 The Profile Groups and Dashboard Groups have to be associated to application module, customer type, and responsibility. Profile groups and dashboard groups should be created prior to associating Profiles to modules. The Customer Profile Engine, a concurrent program has to be run after completing the Customer Profile setup to generate the appropriate profile values. 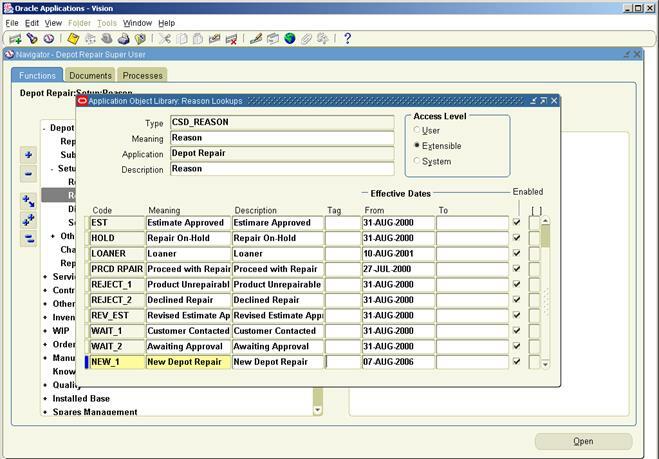 Diagnostic Codes are used in Oracle Depot Repair while processing a Repair order. A Diagnostic Code is associated with a repair problem while a Service Code is associated with a potential resolution to the problem. A complete set up of Diagnostic Codes involves procedures in Oracle Knowledge Management module as well. 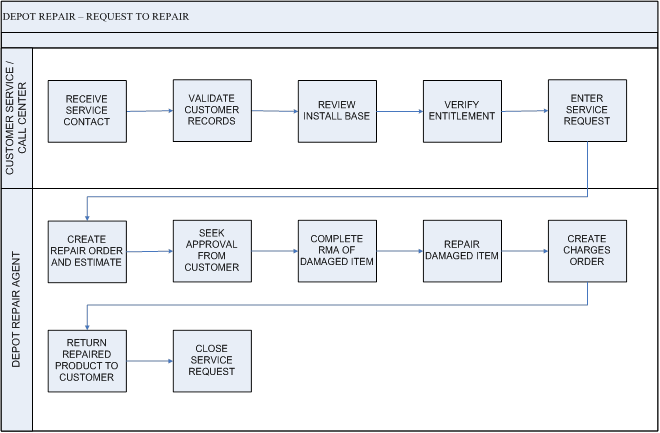 The steps involved in Oracle Depot Repair are given below. Service Codes are used to associate potential resolutions to repair problems and can be used with or without Diagnostic Codes. A complete set up of Diagnostic Codes involves procedures in Oracle Knowledge Management module as well. 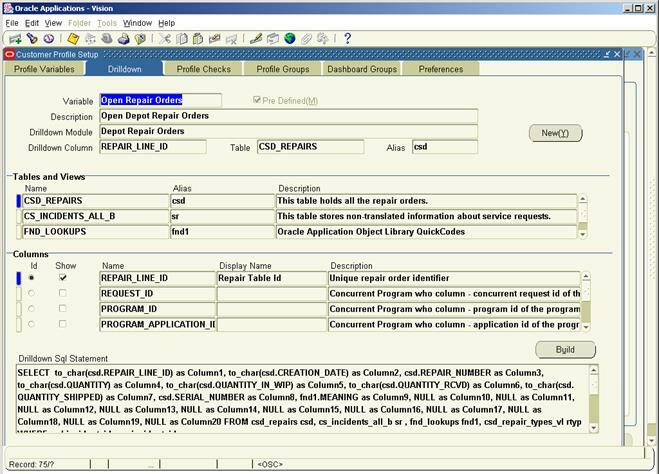 In Oracle Depot Repair, when you create a Service Code, you can associate it with one or more items, one or more item categories, one or more reference bills, one or more alternate bills, one or more reference routings, one or more alternate routings and one or more task template groups. Ø Click New on the toolbar to insert a new row for the new Lookup Code. Ø Make necessary changes to the values to define/change Profile Options at four levels - Site, Application, Responsibility, and User. 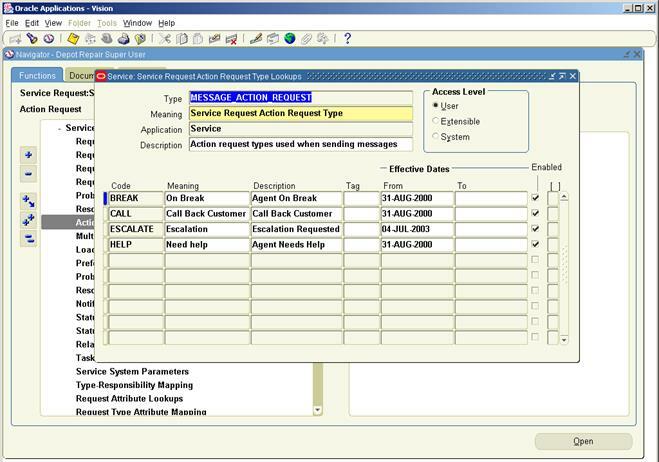 Message action codes help in specifying the action that the recipient of the message should take. They are useful in organizations where workflow based messaging is in use. When the new item transaction is created, the Add to Order Number is derived based on this profile and CSD: Add to Order Num Within Service Request Default. When the new item transaction is created, the Add to Order Number is derived based on this profile and CSD: Add to Order Num Within Repair Order Default. 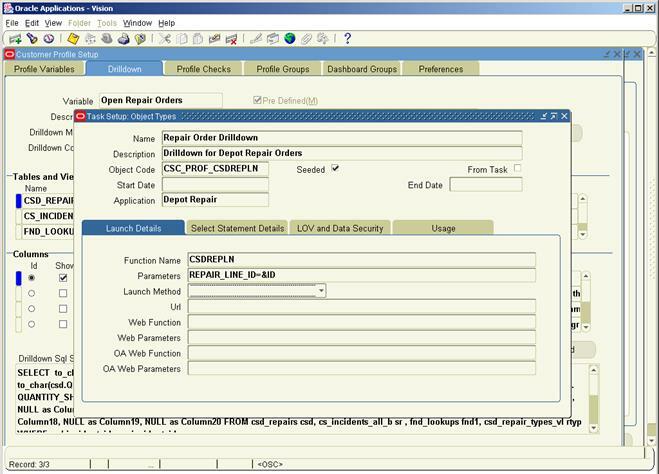 This profile takes the precedence over CSD: Add to Order Num Within Repair Order Default. Setting this profile will cause it to use the order number of the Service Request. Determines whether to allow overriding of the Charge field for Actuals lines. Determines whether to allow overriding of the Estimated Charge field for Estimate lines. Determines whether the creation of a WIP Job without an RMA is allowed. Determines whether to allow overriding of the Price field in the Logistics Tab. Cannot be updated by a User, only by Sysadmin. If not set, the value is taken as No. When set to Yes, automatically closes the Service Request when the last Repair Order is closed. Conversion type to use when converting a cost to the currency of an estimate charge line. Determines whether customer approval of the estimate is required for creating a Repair Job. Determines the Debug level for Depot Repair transactions. Determines the default Category Set for setting up Diagnostic Code and Service Code domains. Specifies the Default Country Code for phone number fields. Specifies the Default Job Name Prefix used while submitting a Repair Job for creation. This profile is applicable only when the profile CSD: Use CSD as Job Name Prefix is set to No. Labor item to use when auto-creating estimate labor lines from tasks. Determines default Pick Release Rule for Repair Order related sales orders. 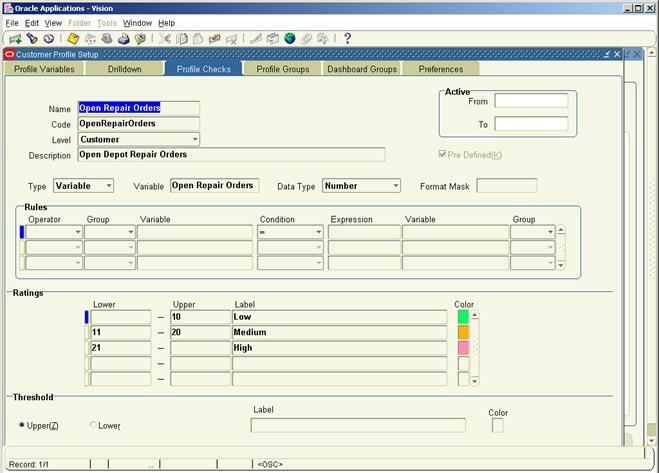 Sets the default price list for the Depot Repair application. Determines the default Repair Job status. Determines default Repair Type for new Repair Orders. Determines default Return Reason Code for item transaction: RMAs. When creating Service Requests from RMA lines via concurrent manager, this severity will be used for the Service Request. 1. 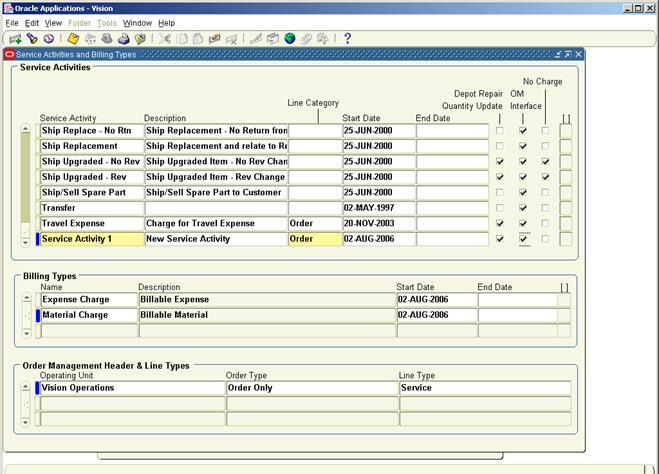 When creating new Service Requests for internal order refurbishments, this status will be used for the Service Request. 2. 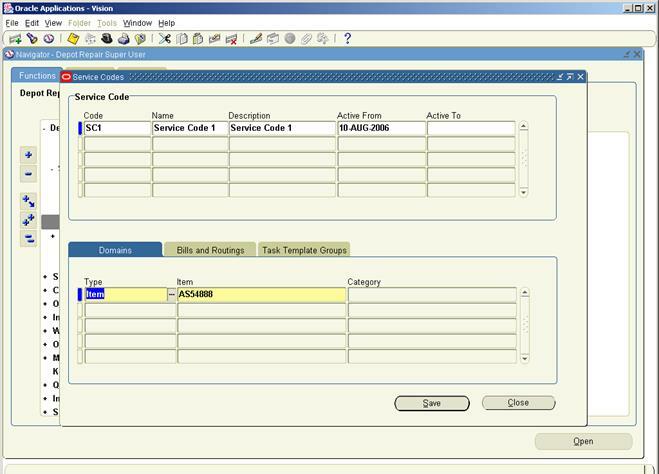 When creating Service Requests from RMA lines via concurrent manager, this status will be used for the Service Request. 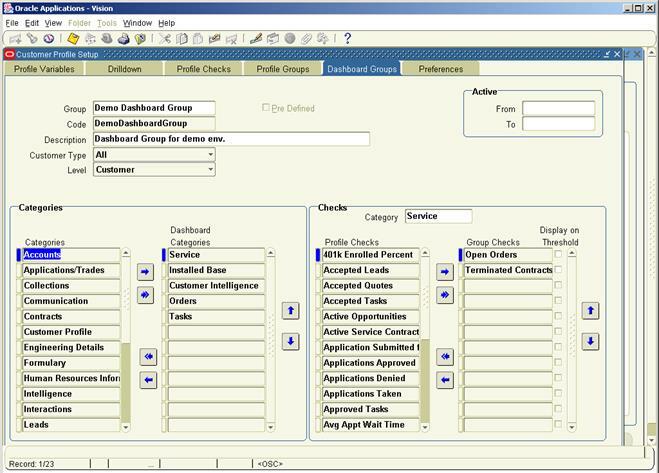 When creating Service Requests from RMA lines via concurrent manager, this type will be used for the Service Request. 1. When creating new Service Requests for internal order refurbishments, this urgency will be used for the Service Request. 2. 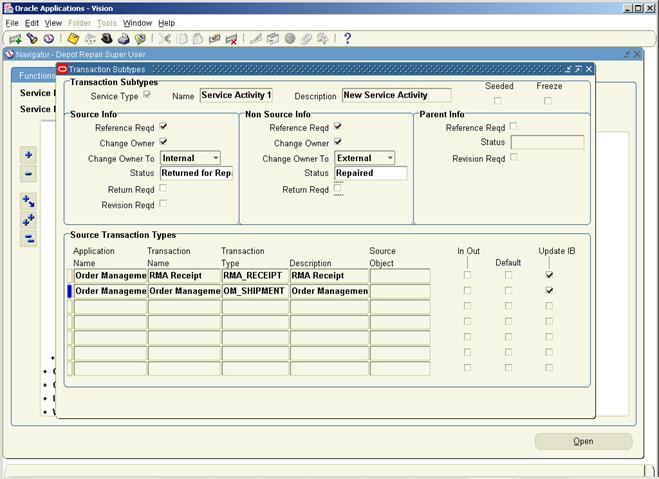 When creating Service Requests from RMA lines via concurrent manager, this urgency will be used for the Service Request. When creating Service Requests from RMA lines via concurrent manager, this work summary will be used for the Service Request. When creating new Service Requests for internal order refurbishments, this severity will be used for the Service Request. List of values displays all active Service Request severities. When creating new Service Requests for internal order refurbishments, this type will be used for the Service Request. List of values displays all active Service Request types. Determines if the net quantity for a WIP job should be defaulted to zero.If it is set to null or No, then the net quantity will be set to job quantity. No predefined set of values. The value is specified at the time of implementation. Determines directory for Depot Repair log files. This is a mandatory profile option. Enables/disables cost fields and buttons for estimates. This determines whether the Repair Estimate tab will be enabled or disabled. If the user sets this option to No, the applicable Knowledge Management area in the Diagnostics tab will be grayed out. If this profile option is not set, Knowledge Management will be enabled. Number of Days to rollback currency conversion when converting a cost from GL currency to currency of estimate charge line. Determines printer for printing repair estimate report. Determines whether a printer is required. Determines Repair Mode for Depot Repair Processes - site level. List of values displays all Repair Types where Repair Type Ref is Refurbishment and Internal Order flag is checked. List of values will display at least one value, as Oracle Depot Repair seeds one Refurbishment Repair Type. 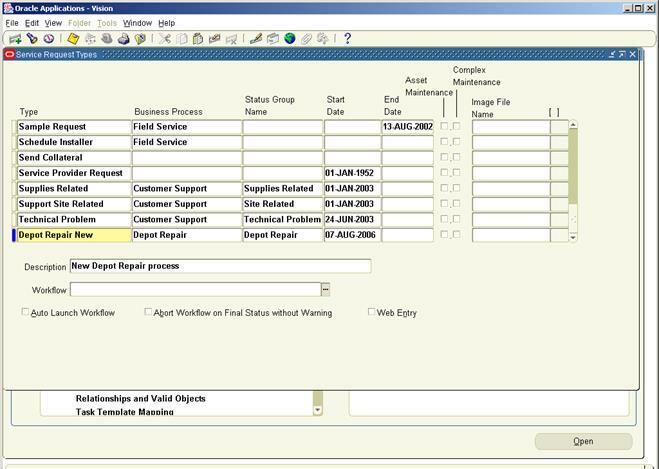 Customer can add more Repair Types with Refurbishment set for the Repair Type Ref and Internal Order flag checked, for example, one each for Task and WIP mode. A value for this profile is required to create internal Repair Orders from Spares Management. Makes the item and related fields required/not required in the Service Request header. If set to Yes, CSD is used as the Job Name Prefix while submitting a Repair Job and the prefix value cannot be updated in the Submit Repair Jobs window. If set to No, the Job Name Prefix defaults to the value specified for the profile CSD: Default Job Name Prefix and the prefix value can be updated in the Submit Repair Jobs window. When set to Yes, auto-creates estimate lines from tasks that are linked to applicable solutions (even if they are not linked via a service code), when you click Add Lines from Diagnostics in the Repair Estimate tab. Please note that there are other profile options which do not under Oracle Depot Repair, but still may provide certain application functionality. 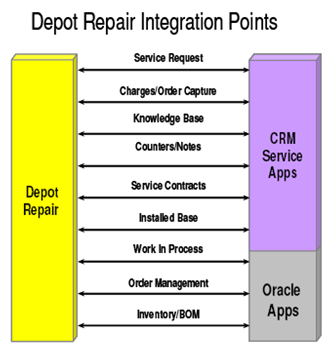 It is very helpful blog on Oracle Service depot repair understanding.